AutoFlare is an automatic lens flare filter based on image content. 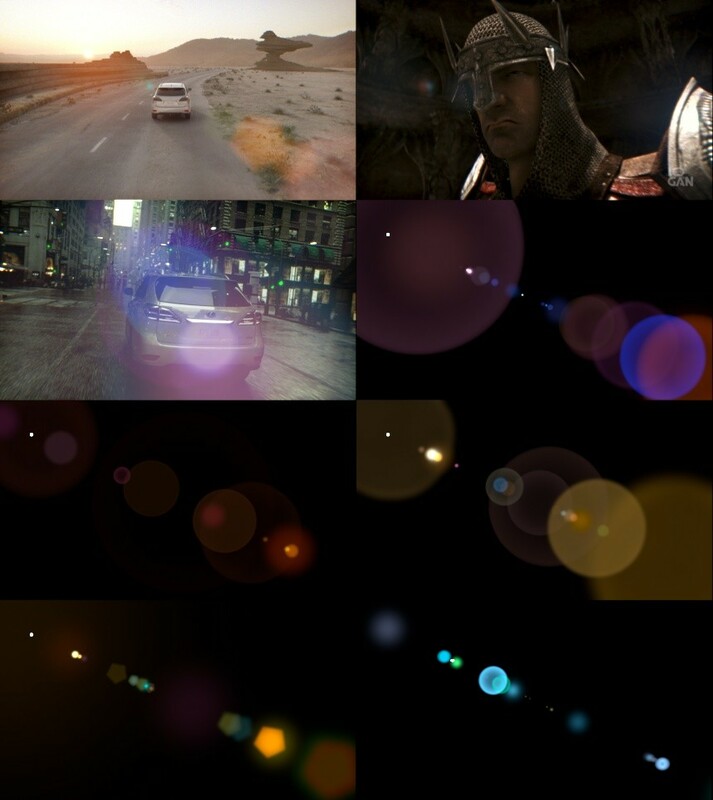 It gives you very detailed controls over every parts of the lens flare if you want to create your own but also has some presets. view highlights selection : lets you see which luminosity range of the image you are selecting to create the flare. brightspot : tells the filter what is the maximum intensity you want to use for flare. threshold : the falloff of the selection. gamma : applies a gamma to the selected area, but as if the selection was normalized before, so it basically change the feather type. quality : speak for itself, basically, the filter is processed over a re-sized version of the image in order to same time. overall mult : overall intensity of the flare. overall lens scale : scale all the lenses at once. overall lens distance : change the distance between every lens. overall saturation : self explanatory. source color : how much of the original color of the source image is mixed in. source saturation : apply a saturation on the image before filter. overall grain opacity : mix the opacity of the grain for all the lenses. grain gain mult : apply a gain on all the grains for all the lenses. reflections opacity : mix the opacity of the reflections for all the lenses. reflections rot offset : add a rotation to all rotations on the reflections of all the lenses. reflections add blur : add a blur to all reflections of all the lenses. ref whitepoint mult : whitepoint (like in the grade node) control for all the reflections of all the lenses. ref gamma mult : gamma control for all the reflections of all the lenses. vignette source : vignette the source before creating the lens flare, it avoids having lens flares turning on and off abruptly. It also prevent the lenses to look like image corners, since the flare generation is made off convolution filters. scale (vignette) : scale of the vignette, proportional to the image. darkness (vignette) : darkness of the vignette (1 is black). active : turn the lens on or off. size : size of the lens. color : color of the lens. blur : blur the lens. axis pos : position of the lens on the flare axis. polygon : type of polygon (visible depending on the diaphragm size). diaphragm : size of the diaphragm, the diaphragm cuts the lens with the polygon shape, kinda like in a camera. diaph rotation : rotates the polygon. grain opacity : amount of grain in this lens (will be multiplied by the overall grain opacity, which is at 0 by default). grain size : size of the grain in this lens. grain gain : gain of the grain in this lens. refl opacity : the reflection parameters are an attempt to simulate the reflections we can see in lens flares, when the full image appears in a lens. This parameters changes the opacity of it. refl rotation : apply a rotation to the reflection. refl whitepoint : whitepoint control for the reflection. refl gamma : gamma control for the reflection. refl blur : blur the reflection. Dashboard is a VFX pipeline tool, it's a web base control panel and communication tool for any artists, producers, project manager on the project. Artists, Producers and project managers have been using Dashboard at Logan since 2009. It would be a little long to explain in detail what the Dashboard does... So here are a bunch of screen shots. I have created a set of tools for different tasks we often do during our work days, most of these tools are python scripts and shell scripts (you can use them as a command line), but I created UI for all of them (in wxPython or directly embedded in Konqueror, a linux file browser). - Publish Clip / Scene / Scripts : A "publication" tool, adapted to this specific project structure. It copies, or "share" users file(s)s to one of the "public folders" (considering the type of file and it's location, maya scenes, image sequences, nuke scripts, etc...), store this action in a database and send emails to the people previously set to receive this information. - Consolidate Clip : A clip is a small group of folders. I created "clips" to deal easier with image sequences and relative movies, proxies and thumbnails. This give us one entity to deal with, as opposed to sequences, movies, mixed up in folders. Consolidating Clip is a tool to create movie, proxy sequence and thumbnail from an image sequence (renders, comps, footage, etc...) all in one click. - mkClip (create a new clip, in konqueror) : Creates a new empty clip at the location. - check clip sequence : Runs a test on each image of a sequence and display a report. (this is useful when we have to deal with CG image sequences). The report format is the same used to our "render job manager" to make it easy to submit the missing or bad frames to the render farm. For Logan I created a new structure for files and folders, adapted to heavy visual effects projects. The idea was to give everyone a very simple workspace with close links to the assets needed for each specific tasks and softwares. The project structure is also made in a way that makes archiving very simple by separating all the different data types (this part is invisible to the artists, producers, etc...). Also the structure itself gives the ability for every assets created for projects to be re-used very easily for further projects. This VFX Project Structure has been used at Logan since 2009. It has been updated and is still easily updated now, without any need to update the tools built around it along the years. Artists from different platforms, Producers, Projects Managers all have a different usage of project folders and files, so I created with them different simplified access to the complex structure, using links and clear naming (projects are naturally complex due to the type of assets we are dealing with, image sequences, different sorts of software files and proprietary folder structures, cache files, dependencies between these files, etc..). Also it needed to be easily adaptable to any new workflow and software additions, keeping the same overall logic, so anyone could always find the assets he needs. - Scripts for adding Users, Assets, Shots to existing projects. - Scripts writing in a SQL Database for projects informations, users, shots, assets or any projects characteristics (delivery formats, frame rate, etc...). "Calc" is a simple shell script command line utility. It checks on a remote or local computer if you have certain running process (typical to visual effects jobs).